Ever since Donald Trump took office, federal agencies have been swamped with Freedom of Information Act requests. This includes the Interior Department. It manages one-fifth of the land in this country, including the wealth of resources underneath it. The agency says it's being inundated with requests for government documents and emails. So it's proposing a controversial new policy that could make it tougher to get public records. Nate Hegyi of member station KUER has our story. 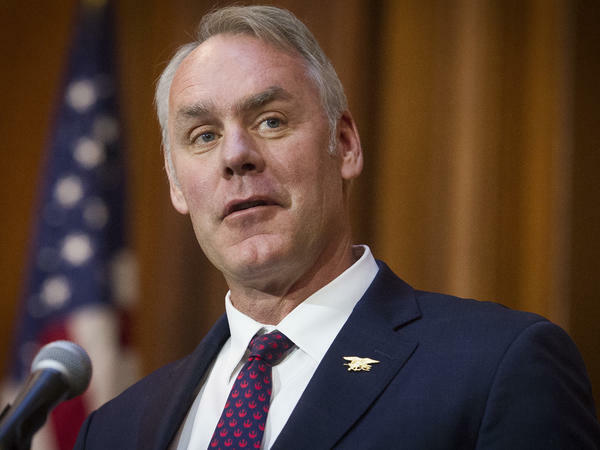 NATE HEGYI, BYLINE: When Ryan Zinke resigned from running the Interior Department, he was under fire from environmentalists, from Democrats and from a flurry of federal investigations looking into potential ethics violations. Here's Zinke on Fox News in late November. RYAN ZINKE: This is politically motivated. In Montana, we call it BS. HEGYI: The investigations were often spurred by public records requests from journalists and advocacy groups like Western Values Project. Zinke called them out specifically to Fox. ZINKE: They're operatives from the Democratic Party. They're hacks. They've always been. And they need to be investigated. HEGYI: Now a new rule from the Interior Department appears designed to make it harder for groups like Western Values Project to get these public records. It allows the agency to put a cap on the number of documents it processes for individuals or organizations every month. And it requires tighter, targeted, more specific requests. This doesn't sit well with Chris Saeger. He runs Western Values. CHRIS SAEGER: What they are doing is a very thinly veiled effort to target critics of the Trump administration and to keep their corruption a secret. HEGYI: Western Values is a Montana-based nonprofit group that advocates for public lands. It is a vocal critic of the Trump administration and has filed around 150 requests with the Interior secretary's office. SAEGER: We file public records requests in order to find out if the people who run the Department of Interior have conflicts of interests with the companies that they're supposed to regulate. HEGYI: This administration in particular embraced industry in many of its regulatory jobs. But the Interior Department says the new rule isn't about politics. It's about, quote, litigious special interest groups asking for thousands of documents and creating a massive backlog at the agency. Hubbel Relat is a top lawyer at Interior. And he says some of these requests are unwieldy. HUBBEL RELAT: A range of information that appears to, at times, be asking for every document that's ever been created by the Department of the Interior. HEGYI: If Interior doesn't respond within 20 business days or people don't get the records in a timely manner, they can take legal action. Western Values, for instance, has sued six times. And at the close of fiscal year 2018, the Interior Department was facing nearly 130 active FOIA-related lawsuits. Relat says this has slowed down the process for everyone else. He says the new changes will make it easier for everyday people and journalists to get public records quickly. But media advocates aren't biting. ADAM MARSHALL: The changes are really incredible (laughter) and not in a good way. HEGYI: That's Adam Marshall. He's a staff attorney with the Reporters Committee for Freedom of the Press. His organization has filed comments with Interior on behalf of 39 news organizations, including NPR. It argues that these regulations will make it more difficult for the public and the press to know what's going on at Interior. MARSHALL: These are things that affect people in a really tangible way. Increased public interest should be welcomed by the department. They should be taking steps to make more information available. HEGYI: Marshall argues that FOIA backlogs aren't new in the federal government. But other agencies aren't changing the rules like Interior is. A 2018 report from Interior's chief FOIA officer blamed their growing backlog, in part, on being understaffed. For NPR News, I'm Nate Hegyi in Salt Lake City, Utah. GARCIA-NAVARRO: That story was produced by the Mountain West News Bureau, a collaboration of public media stations in the Rocky Mountain states. (SOUNDBITE OF KORESMA'S "BRIDGES") Transcript provided by NPR, Copyright NPR.